This post is based on an article I wrote that is getting published in our School Portal tomorrow. Scary? Funny? The girl that told me this story didn’t quite know what to make of it when her friend told her about this MySpace episode: she was the one who had written the phone and name on the table. Last year MySpace was this place for people to make friends and for little known bands to reach new audiences. Today, with over 80.5 million users, if MySpace were a country, it would not be far behind the population size of Russia or Mexico (check back again tomorrow – while this story was being produced, the site gained almost one million users)! As anyone coming from a large city knows, one can expect just about anything to be possible in MySpace. So what makes MySpace special, then? After all, it doesn’t precisely sport the friendliest user interface. Yet it has quite the following. People continue to meet their Mr. and Miss Right after patient searches through the millions of profiles and comments posted. Many old friends and networking opportunities too continue to stay in touch thanks to MySpace. In spite of the site’s size, it seems to hold on strong in the hearts and mice of most of its core users. However, some who would rather keep on logging in are seeing their access to MySpace blocked at school, work or home. At the same time, others are voluntarily deleting their accounts pushed away either by potential stalkers or a feel that the site has lost the personal touch it once had. The mammoth sprawl of the site is starting to take a toll. 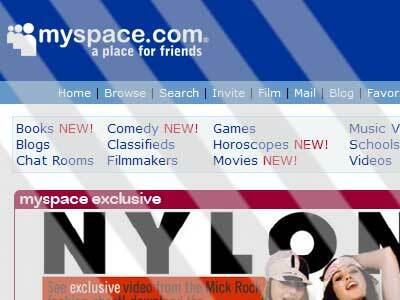 MySpace has easily turned into one of the most addictive online experiences since World of Warcraft. Some people can only be “found” on MySpace: they can only be contacted through their MySpace account and they only listen to music through MySpace. The site already has a reputation of ruining friendships and relationships, not to mention the loss of jobs, sometimes even before people get to an interview. The addiction MySpace causes can get more frightening when those addicted are children, as it is increasingly becoming the case. Kids under 14 (the age limit imposed by MySpace) are spending hours a day surfing the site. If only addiction were the only problem in MySpace. Like the story that opened the post showed, users are exposing themselves more than necessary. And this creates plenty of opportunities for potential predators, as the recent Dateline NBC report “To Catch a Predator” proved. So, is MySpace the problem? Perhaps they can enhance their policing mechanisms (I don’t know they would want to do much about reducing the time users spend surfing their site, though). However, at the end of the day, no amount of monitoring and technology can instill a larger dose of common sense in users, to make them limit the time they spend logged into it or have them give out a little less personal information on the site that will make them an easier target for predators out there. I’ve had the privilege of getting a chance to listen to a very decent bootleg recording of Radiohead, playing live in Copenhagen in the beginning of May. Not only do they still HAVE it (their classics sound as fresh as day one -Planet Telex, Lucky, Let Down and many others). They play a number of precious new tracks that still haven’t seen the light of day on any of their records. As expected, they are continuing to move ahead, setting the pace for the rest to figure out. 4. El mundial 2002 Brasil repitió el campeonato, y es lógico, ya que si sumamos 1962 (donde Brasil fue campeón) + 2002 = 3964, por lo tanto, Brasil debí­a ser el campeón, y así­ fue. 6. Y LO MAS IMPACTANTE: Los fanáticos VENEZOLANOS tenemos también motivo para alegrarnos, ya que seguramente ganaremos el mundial en el año 3964. Porque 0 + 3964 = 3964. O sea que ya sólo tenemos que esperar 489 mundiales para sercampeones! Eso equivale a 1958 años. En 1958 Brasil fue campeón del mundo. Así­ que la final va a ser contra los brasileños… ni se imaginan la goleada que les vamos a dar. Ahhhhh Pobres!